Islamist militants have attacked and occupied a gas facility in Algeria, killing a Briton and an Algerian and taking foreign workers hostage. Algerian Interior Minister Daho Ould Kabila said troops had surrounded the living quarters at In Amenas, where some 20 people were being held. Norwegian, French, British, US and Japanese citizens are among them. Mr Ould Kabila said the militants wanted to leave Algeria with the hostages, which he would not allow. Earlier, the AFP news agency quoted one worker as saying the militants had demanded the release of 100 Islamist prisoners. Another report said they wanted France to end its military operation in Mali. Dozens of Algerian workers were meanwhile said to have been released. It is situated about 1,300km (800 miles) south-east of the capital, Algiers, and about 60km (37 miles) west of the Libyan border. At a news conference on Wednesday evening, Mr Kabila said a heavily armed "terrorist group" using three vehicles had attacked a bus carrying workers from In Amenas at about 05:00 (04:00 GMT). The attackers were repelled by police who had been escorting the bus, but a Briton and an Algerian national had been killed, he said. Two other British nationals, a Norwegian, two police officers and a security guard were also hurt in the firefight, he added. Afterwards, the militants drove to the gas facility's living quarters and took a number of Algerian and foreign workers hostage. They were being held in one wing of the living quarters, which the security services and army had now surrounded, Mr Kabila said. "Since then, they've been facing off. The security forces are consolidating their position around the base," he added. "It seems [the militants] want to leave the region, to leave the country with the hostages. This is completely unacceptable for the Algerian authorities." The minister said nearby border crossings had been closed as a precaution and that the foreign ministry was in contact with diplomats from the hostages' countries. UK Foreign Secretary William Hague confirmed that the hostages included "a number of British nationals", adding: "This is therefore a very dangerous situation." Norwegian Prime Minister Jens Stoltenberg said 13 Norwegian employees of Statoil were believed held hostage at the gas facility. US state department spokeswoman Victoria Nuland confirmed that Americans were among those seized, while Irish Foreign Minister Eamon Gilmore said one of its nationals was a hostage. Japanese news agencies, citing unnamed government officials, said there were three Japanese hostages. Mr Kabila said the militants were from Algeria and were operating under orders from Mokhtar Belmokhtar, a senior commander of al-Qaeda in the Islamic Maghreb (AQIM) before late last year, when he set up his own armed group after apparently falling out with other leaders. Earlier, a man claiming to be a spokesman for the militants told BBC Arabic that al-Qaeda had carried out the attack. 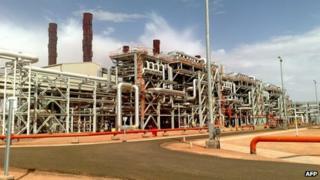 He claimed that they had allowed Algerian workers to leave the gas facility and were only holding foreign nationals. A list of demands had been sent to Algerian authorities, and the hostages would be killed if troops attempted to rescue them, the spokesman added. ''Storming the gas complex would be easy for the Algerian military, but the outcome of such an operation would be disastrous," he warned. Spokesmen for two groups believed to be led by Belmokhtar - the Khaled Abu al-Abbas Brigade and the Signed-in Blood Battalion - said they were behind the incident. The latter told Mauritania's ANI news agency that it had taken more than 40 hostages, including seven Americans, two French citizens and two British citizens. "We are holding the Algerian and French governments, and the hostages' countries, entirely responsible for their slowness in satisfying our demands, foremost of which is an immediate halt to the aggression against our brothers in Mali," added the spokesman. One of the workers told AFP news agency by telephone that the militants were demanding the release of 100 Islamists detained in Algeria. Another worker told France's Le Figaro newspaper that the captors had mined the facility and demanded food, water and vehicles. Militant groups have vowed to avenge France's military intervention in Mali, where its forces have been battling Islamists linked to AQIM for the past week. Algeria has been allowing French aircraft to use its air space.